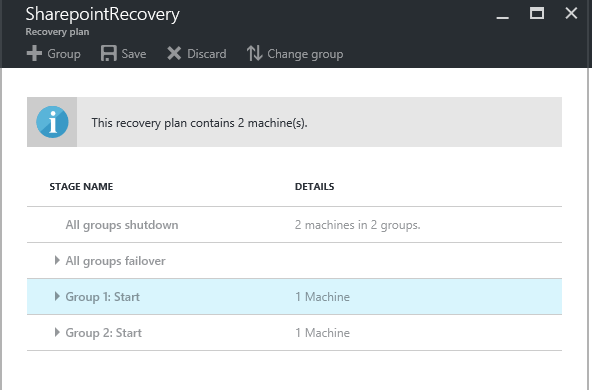 In this article, we describe how Azure Site Recovery integrates with Azure Automation to help you extend your recovery plans. Recovery plans can orchestrate recovery of VMs that are protected with Site Recovery. Recovery plans work both for replication to a secondary cloud, and for replication to Azure. Recovery plans also help make the recovery consistently accurate, repeatable, and automated. If you fail over your VMs to Azure, integration with Azure Automation extends your recovery plans. You can use it to execute runbooks, which offer powerful automation tasks. If you are new to Azure Automation, you can sign up and download sample scripts. 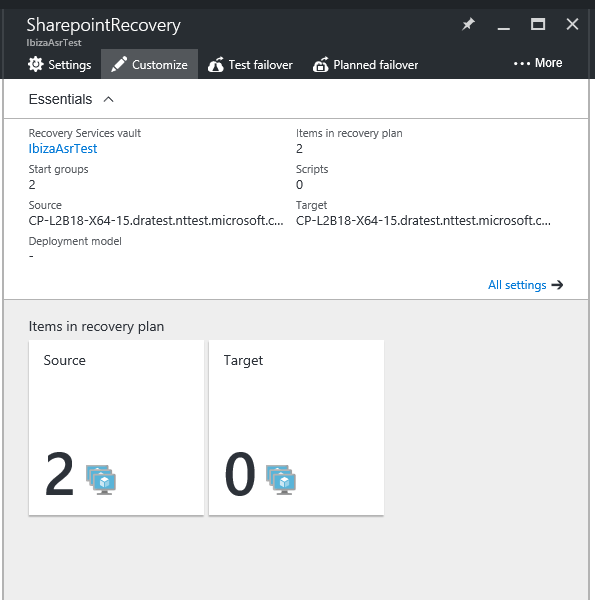 For more information, and to learn how to orchestrate recovery to Azure by using recovery plans, see Azure Site Recovery. 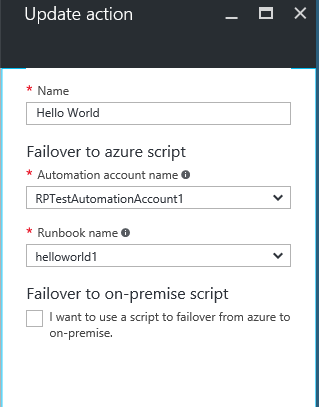 In this article, we describe how you can integrate Azure Automation runbooks into your recovery plans. We use examples to automate basic tasks that previously required manual intervention. We also describe how to convert a multi-step recovery to a single-click recovery action. Go to the Site Recovery recovery plan resource blade. For this example, the recovery plan has two VMs added to it, for recovery. To begin adding a runbook, click the Customize tab. Right-click Group 1: Start, and then select Add post action. On the Update action blade, name the script Hello World. Enter an Automation account name. The Automation account can be in any Azure region. The Automation account must be in the same subscription as the Azure Site Recovery vault. In your Automation account, select a runbook. This runbook is the script that runs during the execution of the recovery plan, after the recovery of the first group. To save the script, click OK. The script is added to Group 1: Post-steps. For options to delete a step or update the script, right-click the script. A script can run on Azure during failover from an on-premises machine to Azure. It also can run on Azure as a primary-site script before shutdown, during failback from Azure to an on-premises machine. The following table lists the name and description of each variable in the context. RecoveryPlanName The name of the plan being run. This variable helps you take different actions based on the recovery plan name. You also can reuse the script. FailoverType Specifies whether the failover is a test, planned, or unplanned. FailoverDirection Specifies whether recovery is to a primary or secondary site. GroupID Identifies the group number in the recovery plan when the plan is running. VmMap An array of all VMs in the group. VMMap key A unique key (GUID) for each VM. It's the same as the Azure Virtual Machine Manager (VMM) ID of the VM, where applicable. SubscriptionId The Azure subscription ID in which the VM was created. RoleName The name of the Azure VM that's being recovered. CloudServiceName The Azure cloud service name under which the VM was created. ResourceGroupName The Azure resource group name under which the VM was created. RecoveryPointId The timestamp for when the VM is recovered. All modules should be of compatible versions. An easy way to ensure that all modules are compatible is to use the latest versions of all the modules. The resource group name and role name values are empty when the script is a pre-action to a boot group. The values are populated only if the VM of that group succeeds in failover. The script is a post-action of the boot group. You can use a single script in multiple recovery plans by using external variables. You can use Azure Automation variables to store parameters that you can pass for a recovery plan execution. By adding the recovery plan name as a prefix to the variable, you can create individual variables for each recovery plan. Then, use the variables as parameters. You can change a parameter without changing the script, but still change the way the script works. In this example, a script takes the input of a Network Security Group (NSG) and applies it to the VMs of a recovery plan. To apply an existing NSG, you must know the NSG name and the NSG resource group name. Use these variables as inputs for recovery plan scripts. To do this, create two variables in the Automation account assets. Add the name of the recovery plan that you are creating the parameters for as a prefix to the variable name. 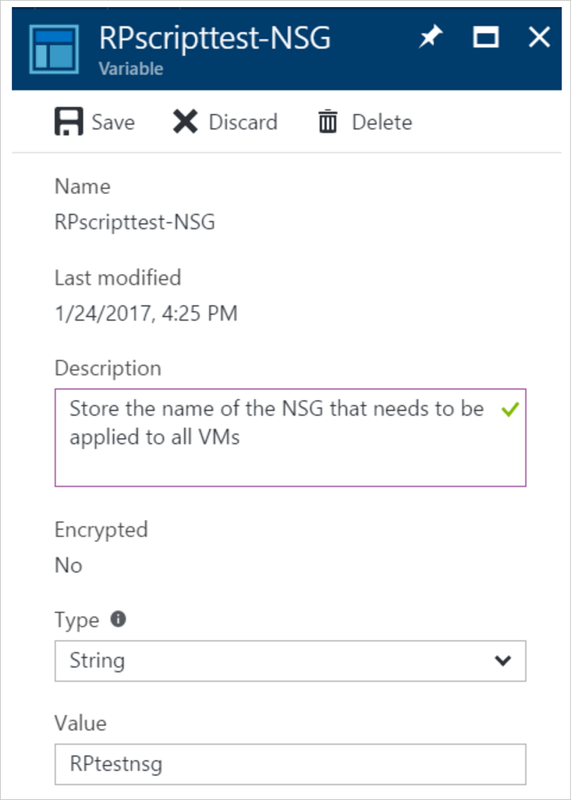 Create a variable to store the NSG name. Add a prefix to the variable name by using the name of the recovery plan. 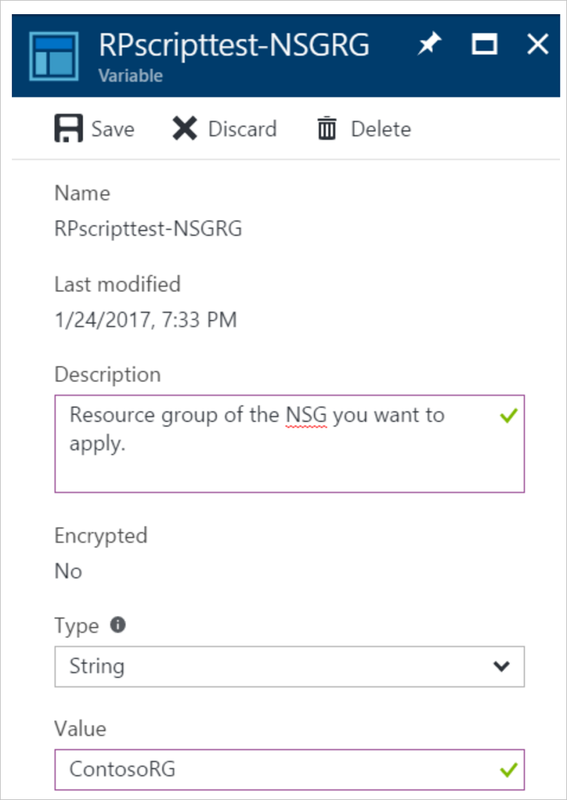 Create a variable to store the NSG's resource group name. Add a prefix to the variable name by using the name of the recovery plan. $NSGValue = $RecoveryPlanContext.RecoveryPlanName + "-NSG"
$NSGRGValue = $RecoveryPlanContext.RecoveryPlanName + "-NSGRG"
For each recovery plan, create independent variables so that you can reuse the script. Add a prefix by using the recovery plan name. For a complete, end-to-end script for this scenario, see Add a public IP and NSG to VMs during test failover of a Site Recovery recovery plan. Consider a scenario in which you want a single script to turn on a public IP on specific VMs. In another scenario, you might want to apply different NSGs on different VMs (not on all VMs). You can make a script that is reusable for any recovery plan. Each recovery plan can have a variable number of VMs. For example, a SharePoint recovery has two front ends. A basic line-of-business (LOB) application has only one front end. You cannot create separate variables for each recovery plan. You can use the same script for different recovery plans. Enter different parameters by storing the value that corresponds to a recovery plan in different variables. 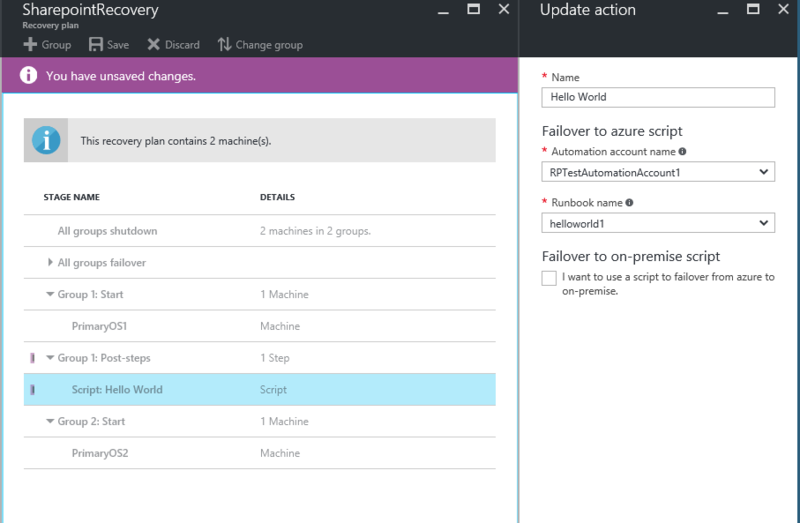 To deploy sample scripts to your Automation account, click the Deploy to Azure button. Learn more about running failovers.